I'd like to colorize a cell based on its contents. 0 = red, 100 = green, and linearly interpolated between. When I do this I get an error saying that I am not allowed to call setBackground. I assume this is because I'm not allowed to change the color of one cell from another because I'm screwing up getting the current cell that the function is running in. How do I get the cell that the function is running in so that I can call setBackground() on it? For example, I'd like to type =LinInt(50) into cell A1 and have A1 be yellow and have the number 50 in it. Then when I type =LinInt(100) into cell A2 it is green and has the number 100 in it. // Prompt the user for a max value number. // Prompt the user for a hue number. Cell: this will only work on one active cell (even if you selected a range). The LinInt and the LinRange speak for themselves. The LinRange uses a batch operation to efficiently set the background colors. The HSVtoHEX function will convert the HSV values into a RGB scheme, that is converted to a hexadecimal value. Originally you had me fooled, by your code. It said: HSVtoRGB but in fact you were trying to convert it to a hexadecimal color code. That's a good thing, because the setBackgroundRGB doesn't allow for batch operations like the setBackgrounds does. Type in the hex. value in colorizer.org and you will get the HSV code. Add an onEdit trigger on the LinInt() function and every entry (integer) will give a change in background color. colorizer.org, gives a real time overview of the diferent color code schemes, like RGB, HEX, HSL, HSV/HSB and CMYK. How can I add a cell's contents to another cell and then automatically delete the contents of the original cell? 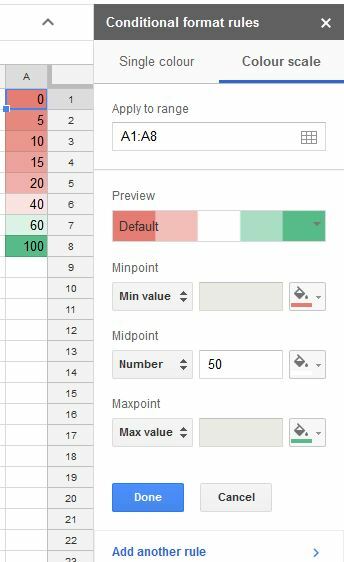 In Google Sheets, how can paste a copied cell/value into several selected cells at once?